Doesn’t sound pleasant, does it? In order to save our pets from fleas, worms and ticks (all of which are out in particular abundance at this time of year), we’ve laid out some helpful guidelines. You need to use a product that kills fleas at every stage of their cycle. With any flea infestation, it’s estimated that only 5% of the population live on the animal while the remaining 95% prance about the rest of your home. Most vet-approved parasite prevention treatments will ensure that a flea dies when it lands on a pet’s skin or takes a meal, it may also render them infertile – stopping the cycle before it begins. It’s precisely because fleas breed so quickly that regular prevention is of paramount importance. If your pet does get fleas, you’ll need to treat your home, too. This helps break the flea life cycle. You can also lower the chances of your pet catching fleas by keeping their bedding clean (wash regularly at 60 degrees) and regularly hoovering any area of the house in which your pet spends a lot of time. We also recommend that you mow the lawn. Ticks thrive in the warmer months so be on the lookout and check your pet’s fur regularly. If you find one, remove it as soon as you can. 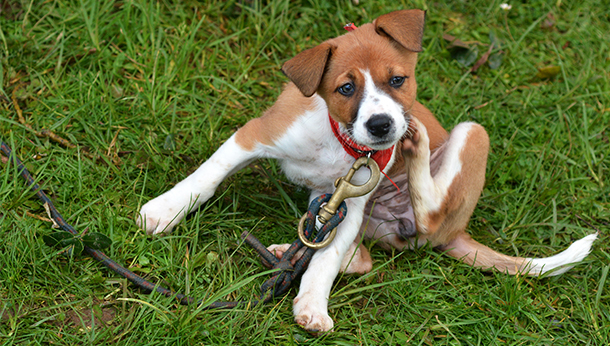 We recommend a specialist tick remover or tick hook; grab the tick by the head as firmly as possible – without nipping your pet’s skin – and remove it in a swift, rotating motion. Be wary of tweezers as they often don’t remove the tick in full. If you’re struggling or don’t feel comfortable, visit the vet right away. Avoid older fashioned treatments such as heat, this can actually increase the risk of a tick spreading disease. Ticks can also spread diseases; the most common is Lyme disease. If you find that your pet is afflicted with a tick, contact your vet for advice. Try not to worry too much! So long as you administer all relevant treatments with the correct frequency, your pets will be able to enjoy their summer itch-free and illness-free! If anything does go wrong, or your pet seems unwell in any way … as always … contact your vet right away. You can never be too careful! Contact us today to book a flea and tick check.